Power Transmission belts, Timing Belts, Go Kart Belts, Fitness Equipment belts and more! help your equipment run better and it's very important to keep them in tip-top shape. We suggest regular checks to make sure they are in good condition to help prevent costly equipment damage. Click here for our FREE Power Transmission Belt Brand Cross Reference Chart. ReplacementBelts.net recommends only leading online resellers of industrial power transmission belts, to help you quickly find the replacement V-belt or Poly V-belt you need. Beltpalace.com has the Comet Belt #203591A and Yerf Dog Q43203W replacement in stock and shipping same day. Our favorite replacement Go Kart - V Belt - Power transmission belt site! 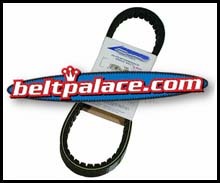 Belt Palace also stocks Timing belts, Air Compressor replacement belts, popular Vento Scooter CVT Belts, Ryobi sander replacement belts, Dental & Healthcare Equipment belts, replacement Go Kart belts, pulleys & sheaves - plus a multitude of power transmission belts for many applications. V-Belts, Poly-V Ribbed Belts, Micro V Belts, Comet Industries Belts, Timing Belts, Go Kart Torque Converter Belts, Manco and Comet Go Cart replacement belts. Buy Replacement Belts Here. You’ll even find drive belts for Exercise Equipment such as LifeCORE Recumbent Bike LC1050RBs (Stex and Diamondback brand treadmill and elliptical machine belts) and for MIG and TIG welding equipment! Are you an inventor with a prototype machine that needs odd-sized or custom poly v belts? Try www.beltpalace.com for hard to find and non-standard drive belts for your prototype machine. Use your mobile phone to call them at their private sales line (USA) area code (574) 519 for specific inquiries, comet industries belts, and made-to-order drive belt sizes. Buy Daily Deals from Groupon, Living Social and Tippr and Earn Reward Points good for Free Stuff at Swagbucks.com. Start today! Print out this handy power transmission belt troubleshooting chart to help identify signs of power transmission belt problems*. It offers helpful suggestions to solve most problems you'll encounter. *Please note this chart is only meant to provide general information and is not intended to diagnose or solve any particular belt issue. We suggest you visit one of our Belt Resellers for a solution to your specific issue. Time to Replace Your Belt? Check our troubleshooting chart to see if it's time to replace that worn out belt. Power transmission belts in poor condition make your equipment work less efficiently and could lead to very serious problems if not replaced in time.